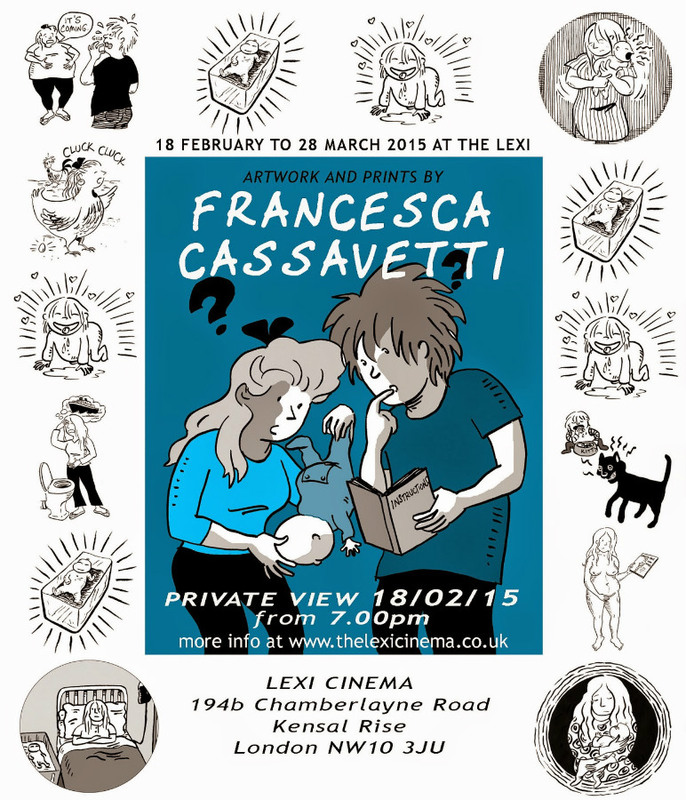 Small Press Round-Up, February 2015 – A Guide to UK Small Press-Related Exhibitions and Events Featuring Francesca Cassavetti, Jessica Martin, Alternative Press, Oliver East and More! 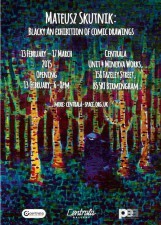 It’s exhibitions (and other events!) galore in February’s round-up of what the great and the good of the small press scene are up to, both within and without the world of comics. There’s a whole host of ‘Small Pressganged’ subjects with either current or upcoming shows across the UK at the moment – some of them comics-related and some of them not. Plenty of dates for your diaries below and I’ve included links to comics/group projects reviewed here at Broken Frontier where relevant. 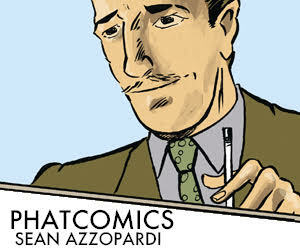 I included this event exploring the psychology of architecture in contemporary graphic novels in the last ‘Small Press Round-Up’ in January but we comics fans are known for our completist mentalities and for that reason I’m mentioning it again here. 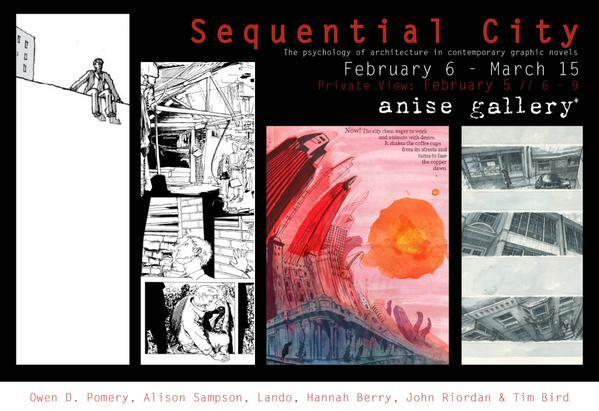 More importantly, of course, I attended the exhibition’s opening night last week and can assure you Sequential City is an excellent piece of thematic curation, featuring six of UK comics’ most innovative creators. 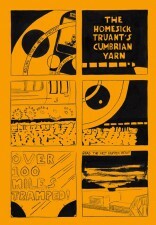 A quick mention here as well for Hannah Berry’s Comics Masterclass which will be held at the Anise Gallery on 28th February priced £25.00. Full details here. 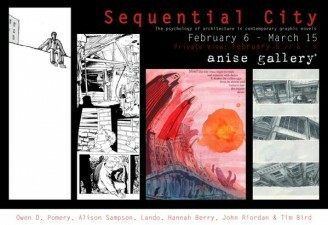 Here’s what the gallery has to say: Sequential City examines the idea of the city through the art of the graphic novel. Original sketches, layers of colour, boxes, panels and strips–the parts the public don’t normally get to see – will be exhibited alongside finished art works. This eclectic exhibition explores the effect architecture has on our mental functions and behaviours through the medium of illustration. Drawing allows us to make sense of the world and through Sequential City we can see how these artists view the modern metropolis. 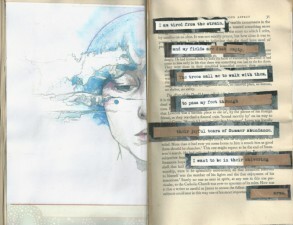 Kathryn Briggs’s graphic narrative Story(cycle) – an examination of the hero archetype as embodied in mythology – was created as part of her Master of Fine Art degree. I reviewed the book in this column back in 2013. She describes her recent project Lost Childhood as “a hybrid of memoir, poetry and visual art that explores the haunting presence of home, the stories and lies we are told as children, and the myths that reach us across thousands of years and miles” and the original (above right) is one of the exhibits at the Members Show at the non-profit, artist-run, project space GeneratorPROJECTS this month. What the Gallery says: Generator Projects are proud to announce the return of their annual Members show, a wide array of artists that make up the gallerys varied collective, feature within an exhibition. The Members Show is where we display the extensive collection of artists that are part of our artist led space, and showcase them for the public to delight through visual, sometimes, audial treats! Ain’t no ship like membership. I reviewed the first of a number of books from micropublishers Centrala – Malgorzata Dmitruk’s Cykle – just this very week here in ‘Small Pressganged’. 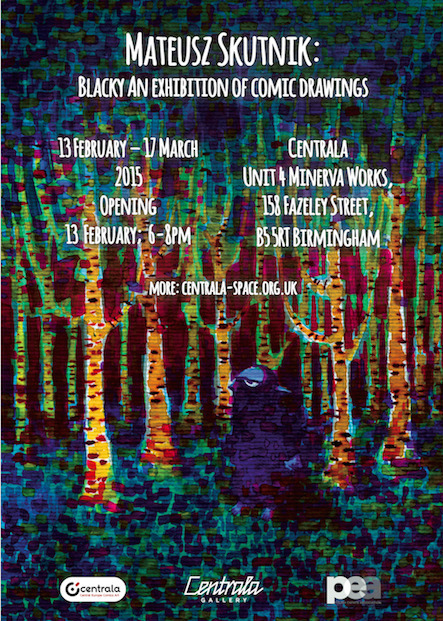 Centrala are currently producing a number of handsome translations of comics material introducing a whole new host of creators to the English speaking market for the first time so this exhibition of work from one of their recent releases – Mateusz Skutnik’s Blacky (see top banner image) – is an excellent opportunity to introduce yourself to their range of Eastern European comics. Here’s what the gallery has to say: We are proud to present a collection of illustrations of Mateusz Skutnik, one of the most prominent comic artists in Eastern Europe. The exhibition will show the story of Blacky – a middle-aged guy living in a big city, growing older and being a parent. It is a funny and thought-provoking collection of bittersweet observations. 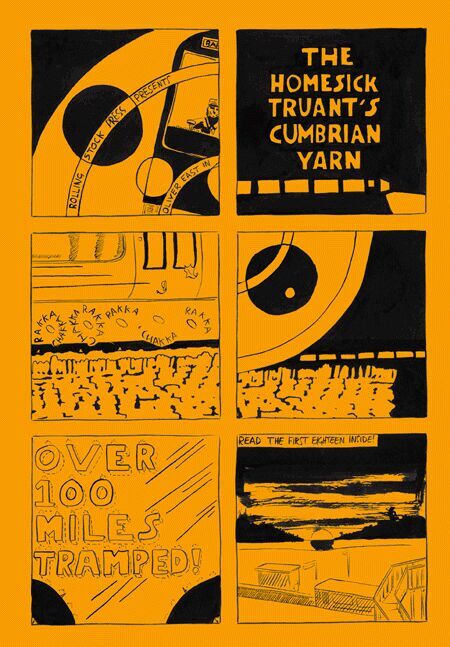 We’ve covered Oliver East’s landscape comics on a number of occasions at Broken Frontier including The Homesick Truant’s Cumbrian Yarn (right) in ‘Small Pressganged’ and his graphic novel Swear Down in the reviews section of the site here. Oliver will be looking for people to share their experiences of the theatre with him but warns in his own inimitable style “I will draw you, so be warned. Shyness will be given short shrift.” An excellent opportunity for theatre-goers to interact with one of the most important creative voices in British comics in the last several years. Here’s what Oliver East has to say: From this coming Monday I will be artist in residence at Manchester’s famous The Royal Exchange Theatre. I will be drawing in situ for seven days, documenting the building and the people who use it, mainly the audience. Francesca Cassavetti, UK small press stalwart – legend, even, some might argue – and also one of the six shortlisted creators for last year’s Myriad First Graphic Novel Competition, exhibits original artwork and prints from her self-published graphic novel The Most Natural Thing in the World. The Alternative Press Takeover at the Bishopsgate Institute was one of the highlights of my small press year in 2015 and their championing of DIY Culture will always have a place in ‘Small Pressganged’ coverage. If you’re interested in the AP and their activities then this group show sounds like a perfect and welcoming entry point to their work and practice. Here’s what the organisers have to say: We will be showing some awesome work from our Pop-Up shop last year, organising a mini zine fair, workshops and screenings (more details to be announced soon). 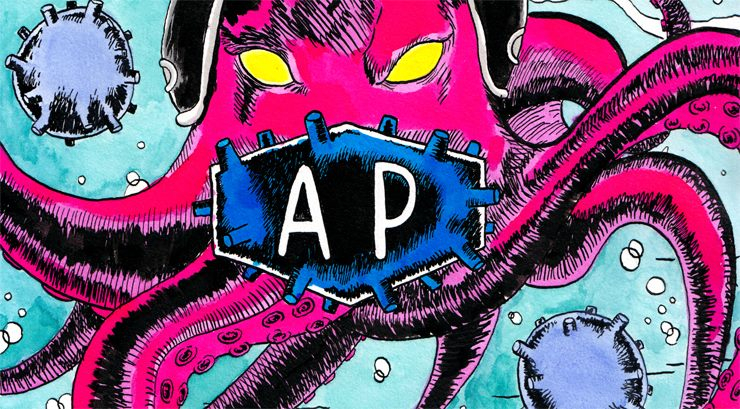 The opening night will be a kind of AP social with some of our favourite bands (such as the AWESOME Giant Burger! ), and even a FREE hot buffet at 8pm! Come along and get involved in AP in 2015, it will be great to see ya! David Robertson of Fred Egg Comics let me know about his next public reading from one of his comics which will be at the wonderfully democratic sounding Scottish Comics Unconference Meet-up at the end of the month. You can see a previous reading of autobio comics material from David at the DeeCAP event in Dundee last September in the video clip below. Here’s what the organisers have to say: This Scottish Comics Unconference Meet-up is open to any and all with an interest in engaging seriously with the medium we study and love: students, teachers, librarians, academics, artists, publishers, critics, readers, collectors… Like a conference, there will be moderators facilitating discussion. Unlike a conference, there won’t be a pre-decided programme and there will be no keynote lectures or paper presentations. Instead, the programme will be decided collectively and openly and the event will consist of collective work sessions facilitated by moderators. This means that the agenda will be set by the participants, not by the organisers. Owen Michael Johnson’s critically acclaimed Reel Love was covered last year in this column and his new venture Beast Wagon‘s Kickstarter campaign is supported with this display of original art and preview pages. 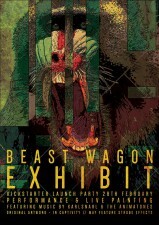 You can see a teaser of Beast Wagon here at Broken Frontier. 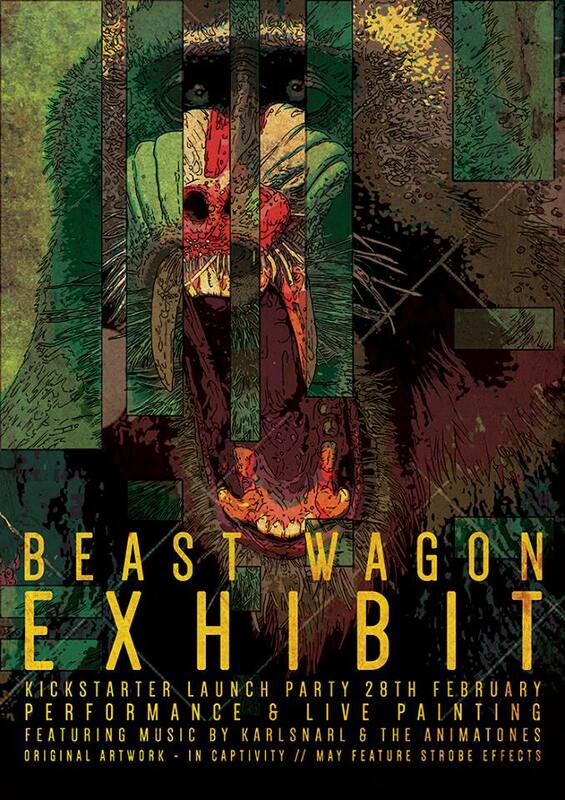 Here’s what the gallery have to say: Features original artwork and preview pages of Beast Wagon; the anthropomorphic comic book set in a zoo, created by Owen Michael Johnson (British Comic Award-nominated Raygun Roads) and John Pearson Illustration. Join us on the opening night for music, performance, spoken word, live art and madness featuring Karl Snarl and the Animatones. 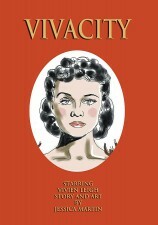 Myriad First Graphic Novel Finalist, two-time selected artist in my annual ‘Ten UK Small Press Comics You Need to Own’ round-ups in 2013 and 2014, and upcoming debut graphic novelist with Elsie Harris Picture Palace from Miwk Publishing later this year. Jessica Martin’s whirlwind comics journey continues apace with an exhibition of her work at the Apthorp Gallery in the Radlett Centre! 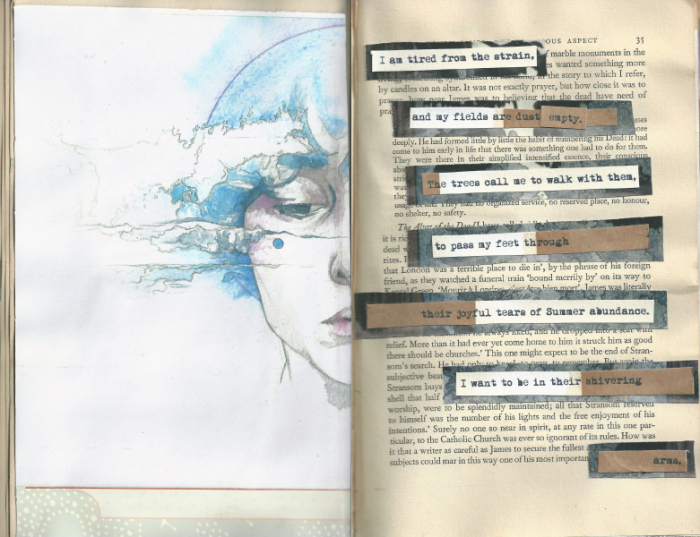 Here’s what the gallery have to say: Jessica Martin, an established actress and emerging writer and comic book artist, presents her exhibition Jessica Martin’s Picture Palace, in the Apthorp Gallery. 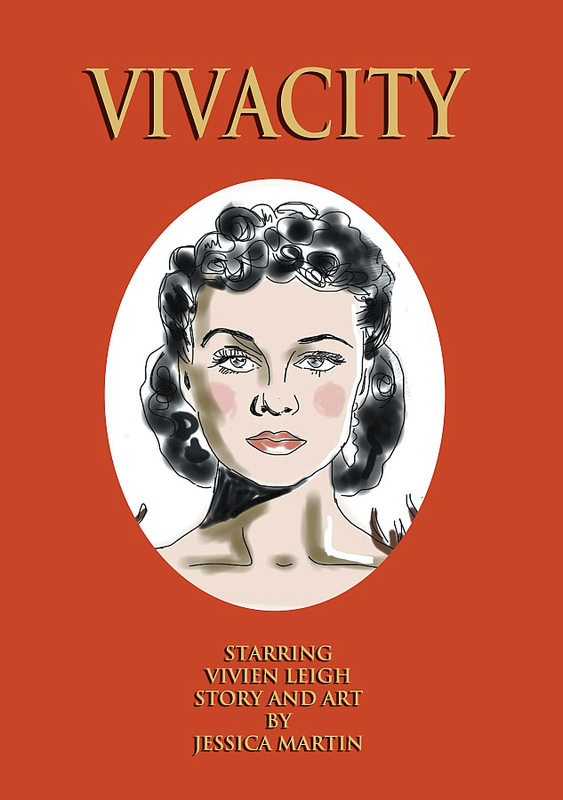 The exhibition will feature a display of original pencil and ink work for her comics and limited edition prints of her film star portraits, as well as copies of her comics ‘It Girl’ and ‘Vivacity’. Thought Bubble Small Press Debut Picks Day 2 – Comics from Lucie Ebrey, One Beat Zines, Dan White and More!